Brag Monday – Beautiful Box and Holiday Stocking! Well, it’s time for the 14th Brag Monday! So now let the bragging begin!!! Today I’m bragging about two people again. I’m starting with Petra from Kunterbunt Cottage. 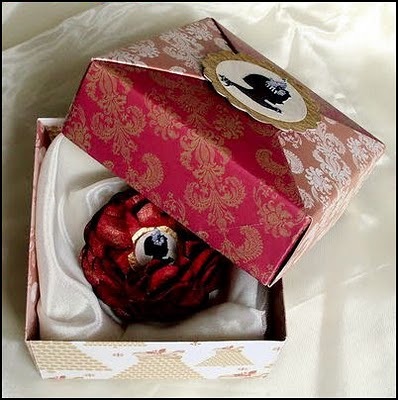 Petra made this gorgeous box, with matching flower brooch, using this sweet silhouette image from Here. I adore the colors she used here, the sparkly touches of gold are stunning with the deep red! 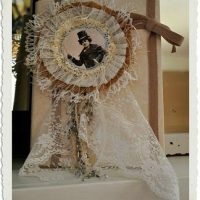 I hope you will stop by her site and check out her other creations, she does phenomenal things with paper and is quite an expert at creating fabulous cards!! And next, I’m featuring Jane from Out of the Crayon Box! Jane made this beautiful wreath stocking, using the wreath image that can be found Here. She added some Polish wording to the wreath, to reflect her Inlaw’s heritage. I think the wording really gives this a fabulous Old World European look! 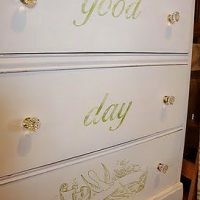 I hope you will pop over to her site she’s quite a crafty gal and has loads of fun projects on her blog! HAPPY BIRTHDAY KAREN!! Love the two featured projects today and thanks for the chance to win such a great giveaway!! I added your giveaway on my blog. Happy Birthday Karen! Thanks for all the wonderful things you do for us out in blogland!! I hope you and your family have a wonderful and joyous holiday season. Happy Birthday Karen. Thanks for all you do and Happy Holidays too. HAPPY BDAY! So glad I found your site! Thank you for all of the fabulous graphics you post for us to use. You are my #1 go to gal when I’m looking for any kind of image. I love the projects you featured from last week. The stocking looked amazing! Happy birthday Karen!!! I wish you have a great time with your dearest. Happy Birthday, Karen! What great projects you featured. Have a wonderful day and a Merry Christmas! Happy Birthday Karen from one Christmas baby to another!!! I would love to be entered in your giveaway!!! I hope your day is fantastic and filled with all of your heart’s desires. Happy Birthday to you! Hope you have a fabulous day! Thank you for the great giveaway! How very generous and thank you so much for the wonderful projects! LOVE them! You have given so much pleasure over this past year that you deserve a bit yourself! Have a fantastic day and a very Happy Christmas! I love Cavallini products so I can’t pass this giveaway by. Happy Birthday to such a generous and caring person. You offer us all these beautiful images but also your friendship. I appreciate it. HAPPY BIRTHDAY!!! how wonderful to be born on the winter solstice! Please count me in on your delightful giveaway! A very happy birthday to you, Karen! I hope your day is extraordinarily wonderful. I have made a recipe card using one of your graphics, but won’t be posting it until Wednesday. It’s just a simple thing, certainly nothing as gorgeous as the projects you’ve featured today. Happy Birthday! It’s always a pleasure to visit your blog! Wishing you a very special birthday today Karen! Such stunning creations shown today, I am in total crafting envy! lol I just wish I could make such beautiful objects! Thank-you for being so generous and posting these images for us! Wishing you and your family a very Merry Christmas! Wishing you a wonderful and special day – HAPPY BIRTHDAY! Thank you so much for all your gorgeous graphics. You always have just the one I need, when I need it – LOL! Karen you are so generous and I for one truly appreciate all your kindness. Have a super day and a Wonderful Holiday Season!! Happy Birthday, Karen! Wishing you a wonderful day and a year filled with happiness! I love all the wonderful images and ideas you share …. thanks so much! I just found this blog and I am so delighted Thanks so much for the great graphics. A BIG Happy Birthday to you,Karen!! Love those stamps! So gorg. Happy Birthday!! And, thank you for all the wonderful images. I just linked one up to you, however I was not able to get the button on my “post”. It is in my sidebar however. Thanks again and have a sonderful day! Happy Birthday Karen; have a wonderful new year! My birthday is the 23rd; isn’t this a wonderful time to have your birthday??? Happy Birthday! 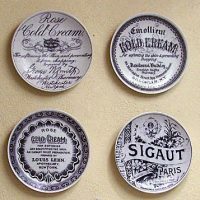 I love all the vintage images that you provide – beautiful! Hope I win the stamps & tin!!!!! You share a birthday with my son. I just called him to wish him a great 28th birthday. He is my baby – where has the time gone? I love your site (I am a subscriber). I don’t often use your images, but I love looking at them. Happy Birthday Karen et thank you for the great images each day !!! Thank you for the opportunity to win these fabulous Cavillini stamps. Have a good day and…MERRY CHRISTMAS ! HAPPY BIRTHDAY a day late! HOPE you have a wonderful year ahead! Happy Birthday! I found your site only a few weeks ago; now I visit daily. Thank you for your generosity. ooo. I so want this. Happy Birthday!! Thank you for such a wonderful blog, and for the chance to win a great prize!! Happy Birthday! December birthdays are so much fun. Thanks for sharing your birthday with us. Happy happy happy birthday Karen!! Hope you have a fabulous day and many many more brithdays to come!! Love tha silhouette flower pin too cute!!! Happy Birthday! Thanks for featuring me! I have just about burnt out on crafting for the time being, so I have nothing new to share today. Actually, I could probably keep going, but my dh wants a craft free apartment for Christmas. LOL. Happy, happy birthday! And another great giveaway, yah! Happy Birthday! I would love to win a gift from you! Happy Happy Birthday Dear Karen! Hope your special day is full of lovely surprises! Thank you for always being so generous and sharing your creativity! I love the creations posted today, so inventive!!! Happy Birthday Karen! Thanks for great giveaway. I love stamps! A Yultide Birthday! December must be a rousing month at your house! Happy Birthday! I try to visit your blog at least once a week, because you always have such amazing images that you’ve shared! Thank you for your generosity! Wow! These creations deserve bragging! Happy Birthday Karen! Thanks for sharing all these amazing images with us and for hosting awesome giveaways! Enjoy your day! happy birthday to you Karen!!! Many happy returns! And thank you for the great giveaway. Thank you for the chance to win that gorgeous stamp! Hi Karen – no pictures to post today but I didn’t want to miss the chance to say HAPPY HAPPY BIRTHDAY TO YOU!!! Happy Birthday To You! How nice of you to give a present on your birthday rather than receive one…but we shouldn’t be surprised, you share so many things with us everyday! Thank you! How kind of you to give a gift on your birthday — Happy Birthday! Those stamps are lovely and elegant. Happy Birthday! Thanks for the great giveaway. HAPPY BIRTHDAY TO YOU-I hope you had a wonderful birthday. You are sooo generous with your pictures and giveaways, I hope you were spoilt with gifts of love. A very HAPPY BIRTHDAY TO YOU! May it be filled with all the magic you share with others. Thank you! Oh happy happy birthday to you. Gorgeous stamps. I have just discovered your blog and am in love. Keep up the inspiration. This is my first week to enter Brag Monday fun. I’m not quite sure how this works though…your post was not up early this morning…do you select blogs to feature by the previous weeks Brag Monday participants?? I want to participate frequently and want to know that I’m doing this correctly..LOL Thanks in advance for the help. What a beautiful stamp set that is your giving away. Hope you have a wonderful holiday. Happy happy birthday! Hope your day is filled with wonderful things. Thank you for the chance to win this beautiful set of stamps – they are so versatile. Love the graphics of late. Oh my goooodnesss…. GET OUT! What a wonderful giveaway…..I am loving it. I am needing it….I am coveting it. And, for YOUR birthday? Happy, happy day! Hope your day was wonderful and will continue all week! What a wonderful giveaway! Wow, what a great set of stamps!!!! Please enter me! Happy Birthday Karen,thank you so much for all your sharing! i hope you eat lotsa cake! Happy Birthday! I love receiving so many lovely images to use in my artwork. Thank you so much! Love your giveaway too! Well I’ll add my very Happy Happy Birthday to this mega chorus here Karen! I always check your blog, it’s such fun, and you have such delightful images. I had already made the St Nick “book” when I came over here today, so added the link to that! Didn’t know I would be lucky enough to enter a giveaway! Happy, Happy Birthday! I love your blog, and I’m so glad I found it! Happy Birthday Karen!!! Again two more beautiful projects on Brag Monday! Thank you for all the lovely images you share with us!!! Happy Birthday to you! It doesn’t seem right that it is your birthday but one of us will get the gift! Thank you so much for such a great giveaway! Wishing you a great birthday evening! Hope you have had a fab birthday! Love to have the giveaway. Happy Birthday! I really enjoy your blog….thank you for sharing with all of us! I would love to put my name in the drawing for the wonderful stamp set. Happy Birthday, mine is the 23rd. I would love to have a late birthday gift. Happy Birthday Karen. Thank you for the chance to win a great giveaway. Love all your graphics. have a wonderful birthday and a fabulous holiday season!!! Thank you for all the inspiration year round! Have a great holiday and Happy New Year to you! Happy birthday! I am also a Dec baby gal and my birthday is coming up next week! Enjoy your special day and keep those vintage finds coming! I love them! Happy Birthday. I hope you had a nice one. 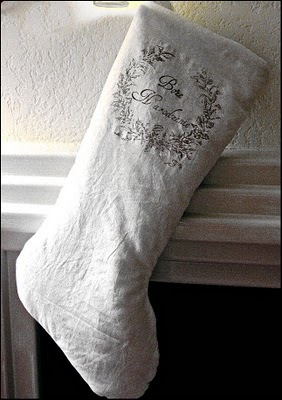 I love the Christmas stocking that was posted on today’s blog. Have a Merry Christmas!! Happy Birthday! Thanks for all of your wonderful images, they have given me so much joy this holiday season! HAPPY BIRTHDAY TO A GREAT GAL!!!! I hope your day was full of happiness and surprises! Anyway, I visit your blog every day. I love it! I’m very excited about your giveaway. Please put my name in the hat! And I would love to win those stamps! I love this new concept of giving away presents on your birthday. I hope you had a wonderful one. I love your graphics and always look forward to seeing what you have. I’m trying to do the coasters project now for a Christmas present. Anyway, please enter me in the contest. I haven’t finished the coasters yet, so have nothing to brag about (haha). Happy Belated Birthday!! This is really a great site~ I would love to be entered in your giveaway. Thank-you. Happy Birthday! You have a wonderful blog! Thanks. Best wishes for your birthday and happy Christmas. Love your graphics! Happy Bird Day, two ewes! Happy Birthday!!! I WOULD love this, but I love your blog, period! Thanks so much for all that you offer us..it really is a fun thing! Hoping you are having a wonderful day! This is my entry for the giveaway for today! Happy Birthday! Thanks for creating such a great site! I recently discovered your blog and am loving it. Happy Belated Birthday! Love the ones you bragged about today. Hope to add something some monday but not till after Christmas. to them so they come to your e-mail? Please enter me in your giveaway. Happy Holidays and Happy Birthday. I’d love to receive a gift for your birthday…I love your site, and thanks for all the freebies! Happy Birthday! And many more, now blow out the candles! I am so glad I stumbled across your site. I love it. Thanks for the givaway! Thanks for the chance to win! Love your freebies! 2nd comment for the giveaway! Your blog is so inspirational and I love your other site too! I may live in the sun but your gorgeous graphics and ideas as well of those contributed by others enable to me to enjoy the “original” christmas spirit! Happy Birthday all week long! Thanks for the givaway! well, today is my birthday and I would certainly love to win the stamp set. Hope your day was as lovely as mine has been today. I am wishing you and your family a very Merry Christmas. I cannot believe how fast it came around this year. Happy Belated Birthday! I just recently discovered your blog and I just love it. What an awesome giveaway too – I love to stamp! Happy Belated Birthday! I hope you had a wonderful day and I hope you have a joyous Christmas! Thank you for the presents you share with us! Happy! Happy! Very elegant stamp set! Love the stamp set, Karen! congratulations a little late from Germany !!!! Happy Birthday – Just found your site through Cocoa Daisy – LOVE IT !!! Merry Christmas & this is a must go to site for me !!! Merry Christmas, Karen. Thanks for the birthday giveaway, I would love to win the stamp set. Merry Christmas and Happy Birthday! I just found your site and have been enjoying going back through to see all of the lovely inspiration! I hope you are having a very merry christmas day! We got 1ft of snow here so it really is a beautiful white christmas. Thanks for the chance to win a give-away. Have a great holiday! Merry Christmas to you and yours , Karen. Thanks for the opportunity to win such a beautyful gift. Thank you for the givaway. Hope I win! Love those stamps! Also, I appreciate your generosity in sharing your vintage graphics. Not many people would take the time to enhance and post so many graphics 🙂 Happy birthday! Best wishes to the birthday girl. I want to win those stamps so choose me please! Love the stamps! Thanks for the chance to win. Wishing you many more wonderful years to come. Happy Birthday! I love your blog! I just found it via Just Something I Made, and I’m already thinking up some fun projects to make with your gorgeous graphics! Thanks for making such cool stuff and giving others the opportunity to use it! Hope you had a wonderful Christmas and will have a good and Happy New Year. Looking forward to so many of your beautiful vintage art clips. Thank you so much. A belated happy birthday Karen, and I hope your holidays were joy filled. I used some of your Christmas clip art as avatars on my twitter page and they were adorable! I just came in to find a New Years one and found your contest. Please enter me in the giveaway.Thanks for sharing all you do! I want this SOOO much! Pick me please!! LOVE! Hi Karen. HAPPY belated BIRTHDAY!! Hope it was a great one! This stamp set is fabulous! Would LOVE to win it!! Thanks for the change! Happy New Year to you! I always love visiting your site…thanks for sharing such beautiful images! Happy belated birthday Karen! Your creations fantastic! I wish I had found your blog sooner. Thanks for doing such a great giveaway =) Keep up the amazing work and have a great 2010 !! Thank you, Karen, for the wonderful placemat project. I am going to try to do it this week. Have a great day!! I have been enjoying this blog for several weeks now and finally I have made a blog! You can find me at Mamma’s Melange and I have lots of art that I am making from your beautiful graphics. Thank you and Happy Birthday!